More children, more wives, more boys - that's the Afghan sexual ideal. But that increases the sexual anxieties and so yes, there's more sexual health enhancers on the market too. On one of Wednesday’s editorial of the renowned French newspaper “Le Monde” titled "Le Mexique miné pour les barons de la drogue” (Mexico undermined by the drug barons) caught my attention by it scathing of the text. It’s not because it says anything that isn’t true, on the contrary, sums it up very well the terrible situation that the country stands, thanks to the unbeatable fight against the drug cartels that president Felipe Calderon launched more then three years ago. Is President Calderon ready to discuss drugs legalization? Marihuana plants: Photo from nautilus After almost four years that President Felipe Calderon launched unilaterally the war against the drug cartels and the organized crime, and defined it as a face to face fight. President Calderon told the Mexican society, back then, that this war was necessary to bring back peace and security in the country, but that has not been the case for many, where the fierce fighting between the drug cartels for territory and clashes with federal police forces and the army is underway; their lives have changed drastically. Their daily lives is a complete nightmare, they live in constant fear, not knowing if they or a loved one will return home safe and sound or get killed in the middle of a crossfire of a shootout. This fight have claimed, according to the Center for Research and National Security, the Mexican Intelligence Agency (CISEN), twenty eight thousand lives. It seems that finally president Calderon is open to suggestions. 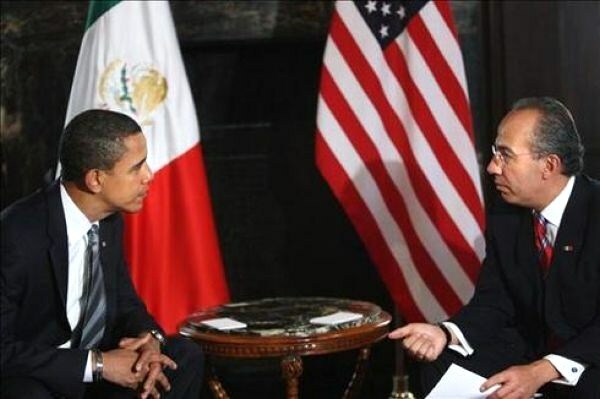 On Wednesday President Felipe Calderon met with President Barack Obama at the White House. The top issues that both presidents discussed were obviously the war on drugs and immigration, the latter got to the agenda, if it wasn’t for the anti-immigration law SB1070 that was approved last month in Arizona, causing outrage in all sectors of the Mexican society, otherwise this state visit was going to focus only on the war on drugs and border security.